Over the past two weeks I’ve shown the development for the opening scene of Last Viking. 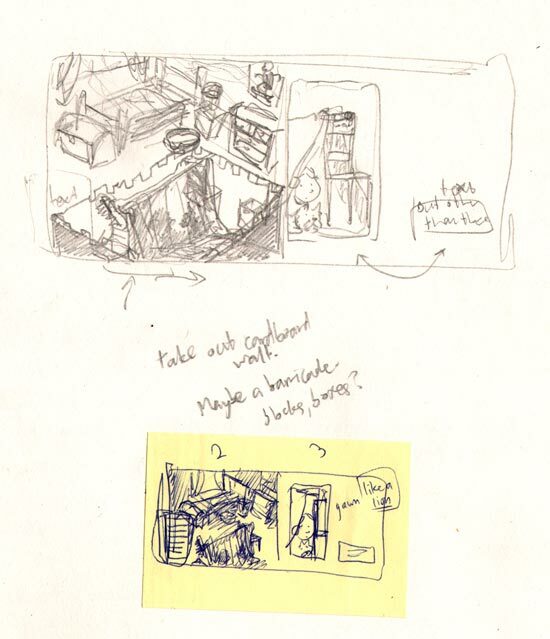 Here’s the first roughs, and here’s some more developed ideas. This week I’ll show the final rough and pencil outlines, and how I got there. I’d decided the scene would take place in Josh’s bedroom. He’d be in a cubby house with his dog at night, and there’d also be a panel on the right set in the morning. a small note on the post-it wonders if Josh might yawn like a lion in the morning: to go with the phrase, "But other than those things, Josh was as brave as a lion". Categories: final artwork | Tags: bedroom, cubby, cubby house, cubbyhouse, final, Josh, opening scene, pencils, rough, Wolverine | Permalink. Last week I wrote about how opening scenes work, and showed some early roughs of the opening scene for Last Viking. So with those things in mind, I kept sketching. 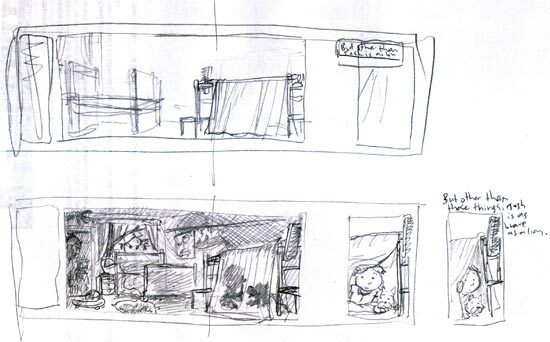 I did a little set of thumbnails where the double page spread would have two panels. One would be big and dark, showing Josh’s room at night time. Josh and Wolverine are visible only as silhouettes, seen in a cubby made from a blanket. The bulk of the text would relate to this panel and go in a column at far left. The thinner panel on the right would show Josh and Wolverine poking their heads out from the cubby the next morning, with the line, “But other than those things, Josh is as brave as a lion” written close by. Here’s a bigger version with some tone added. There is still a silhouette of a dinosaur on the far wall. Josh’s skateboard is on the floor next to Wolverine’s cushion. Categories: final artwork | Tags: cubby, cubby house, cubbyhouse, day, gutter, Josh, night, opening scene, panel, viewpoint, Wolverine | Permalink.